For as long as I’ve been a Christian—40 years—I’ve loved academic books. Through the years I’ve seen the academic sections of Christian bookstores grow increasingly smaller, if not disappear entirely. Why? Quite simply, the books don’t sell fast enough. Every space in a retail store is valuable, and most retailers don’t want to offer space to books that may only have a turn rate of 1-2 a year. Is the answer just to give up on it? I don’t think so. Like anything important, it takes some work to pull it off, but don’t let the work scare you—it can be done. Carry the product. You can always special-order a particular title, but customers want to come in and browse. They want to pick up a book and spend time with it. If it’s not there, it just won’t sell. To stock your academic shelves, start by focusing on some significant frontlist titles. Carry a selection of Systematic Theology by Wayne Grudem or something similar. There is a popular edition of this title by the same author called Bible Doctrine (both Zondervan). The same is true with Christian Theology by Millard Erickson. That’s the big one, but the more approachable version by the same author is Introducing Christian Doctrine (both Baker Academic/Baker Publishing Group). You also can’t go wrong with authors like N.T. Wright, Craig Blomberg, Kenneth Bailey and D.A. Carson. These authors offer significant works for scholars, pastors and students—and they sell! Your vendor reps can be very helpful here. Let them guide you in selecting books for your market. Reach out to local pastors. Involve these leaders in making your selections. What authors/books do they like? What titles would they recommend? If they know you have it, they can guide buyers to your store. 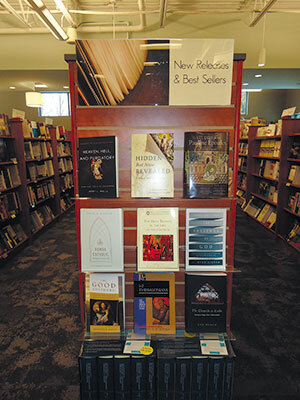 Feature a printed review on the shelf by the pastor who recommends the book. Know the buzz in academic circles. Staying current is easier than you might think. When you notice several books on a topic, you can pretty much guess that discussion is taking place among academic thinkers. Sometimes an article in Christianity Today, Christian Retailing or a similar publication can alert you to topics in play. Some publishers also offer blogs you can follow (e.g., Baker Academic and Wm. B. Eerdmans). For instance, if you don’t know that there is a debate right now on the historical Adam, you’re asleep at the wheel, academically speaking. 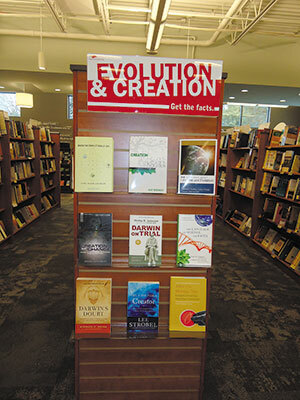 Once you discover the issue being discussed, create an endcap featuring the books that are interacting with it. Here are a few suggestions for the historical Adam subject: Four Views on the Historical Adam edited by Matthew Barrett, Ardel B. Caneday and Stanley N. Gundry (Zondervan); The Evolution of Adam by Peter Enns (Brazos Press/Baker Publishing Group); and Did Adam and Eve Really Exist? by C. John Collins (Crossway). You also should be at least familiar with significant terms like a “new perspective on Paul.” It is arguably an issue that has revolutionized Pauline studies. This leads me to my next point. Hire knowledgeable staff or educate your current staff. If you have a Bible college or seminary in your area, hire one of their students. You will have to train them how to effectively use their knowledge in a retail context. I quickly learned that what I might like on a topic might still be over the head of my customer. Take your time. Ask plenty of questions. Develop a relationship. When you place your frontlist order, ask for a gratis copy of an academic title and give it to your staff to read. Create a mini library of such titles in the backroom for store staff to read, or give it to your “academic” person as a way of saying thank you for their effort to stay current. Learn which vendors offer a good academic selection. Among the best are Baker Academic, Brazos Press, Crossway, Eerdmans, IVP Academic and Zondervan. Other vendors worth watching are Hendrickson Publishers, P&R (Presbyterian & Reformed) Publishing and B&H Academic. Bring back the academic reader. When the books are in and the staff is educated, how do you get those academic customers back? Try hosting a book club on a topic of interest like the historical Adam. Invite a pastor to conduct the discussion and advertise the club in your community. Offer a discount on the books related to that issue. Invite an author to come and speak. Too costly? Try a Skype session. Use in-store flyers to inform your customers that you are expanding the academic category. List some of the featured titles with a short blurb about the book. Ask your vendors for co-op dollars for advertising an event. Allow some time for sales to build. Be patient. You have to be willing to allow these books to have their time on the shelf. Rotate the selection. Do regular returns and bring in fresh frontlist titles while maintaining some standard backlist titles like those mentioned in my first point. Like any new category, it will need time to grow. I know what some retailer is thinking. What about Amazon? How do you compete with those prices? Let me be blunt. We need to stop whining about Amazon and do something about it. Price is a factor, but it’s not everything. I’ve developed relationships with customers over the years. They depend on me to tell them what’s new and what’s worth reading. It is the relationship that is the driving factor—not price. Amazon, and any other online dealer for that matter, can compete with a price tag, but they can’t compete with me—and they can’t compete with you. I’m the face of my store for my customer. When my customers come in, they talk to a real person who has read the books and can answer their questions. They come in with their questions and want to know what I would recommend. Amazon doesn’t know if a customer is Reformed, Lutheran, Methodist or Catholic. When a customer wants a book on spiritual gifts, I ask if they want a book from the perspective of a charismatic, Pentecostal or a cessationist (that the sign gifts are no longer for today) position. Often I find the customer is not even aware of the difference or has not thought about it. Once the question is asked we can start a conversation and help narrow the selection. Amazon is a machine. Its best customer service is an email thanking you for your order and telling you your book has been shipped. We’re better than that every day of the week! Who is the academic reader? The student, pastor, teacher, small-group leader or interested lay person. They’re out there and they are reading, and they are saving money in order to buy books. Pastors often have a book budget, and students save to get those costly reference works. It’s better to have them spend that money with your store rather than online. Louis McBride has worked for Baker Book House for 15 years and has served as the academic buyer for the last 10 years. He is a graduate of Trinity Evangelical Divinity School, where he studied theology and church history. Some of the authors he has hosted in the store are William Lane Craig, Norman Geisler, Alvin Plantinga and Michael Horton. As it turns out, another author I was hoping to invite was to be at the same event. With just a few emails, we were able to get both authors. It became one of our store’s best-attended events. Consider contacting local seminaries or Bible colleges to see if you can get a professor to come and speak. We have conducted a couple of Skype events at little or no cost. Some author fees can be quite costly, but others can be very reasonable. How do you put a dollar value on the number of new customers a speaker might bring into your store?